This is the first time India has issued a demarche to US since the row over diplomat Devyani Khobragade in 2013. New Delhi: India has issued a strong demarche to the US over the arrest of 129 Indian students who have been detained over charges of alleged visa fraud. This is the first time that India has issued a demarche since the diplomatic row that erupted between the two countries over the arrest and detention of diplomat Devyani Khobragade in 2013. “A demarche was made to the Embassy of the United States in New Delhi by the Ministry of External Affairs. Our concern over the dignity and well-being of the detained students and the need for immediate consular access for Indian officials to the detainees was reiterated,” the Ministry of External Affairs (MEA) said Saturday. India has been seeking consular access to these students since Wednesday when they got arrested by the US Department of Homeland Security. The Ministry of External Affairs has said so far they have been able to get in touch with only 30 of them. “We underlined that students, who may have been duped into enrolling in the ‘University’ should be treated differently from those recruiters who have duped them. We have urged the US side to share full details and regular updates of the students with the government, to release them from detention at the earliest and not to resort to deportation against their will,” the ministry added. As many as 130 students were arrested by the US authorities Wednesday for overstaying their visa in the US. Out of these, almost 129 are claimed to be Indian students and student recruiters. The arrests were made by US Immigration and Customs Enforcement (ICE) in a series of late-night and pre-dawn raids. This was done following an investigation by Homeland Security Investigations (HSI). While efforts are on by the Indian missions and consulates in the US to get in touch with the detained students, the government has also mobilised its widespread diaspora community and other Indian associations there to garner more details on these students from detention centres. 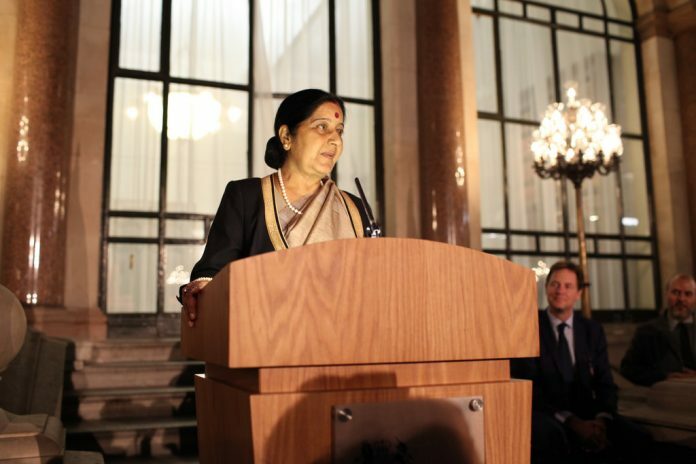 Minister of External Affairs Sushma Swaraj has said that she will give “highest priority” to this issue. According to ICE, between February 2017 and January 2019, the defendants, a group of foreign citizens, conspired with each other and others to facilitate hundreds of foreign nationals in illegally remaining and working in the US by actively recruiting them to enroll into a metro Detroit private university that, unbeknownst to the conspirators, was operated by HSI special agents as part of an undercover operation. “We are all aware that international students can be a valuable asset to our country, but as this case shows, the well-intended international student visa program can also be exploited and abused,” US attorney Matthew Schneider, who is looking into the case, said earlier this week. The case is believed to have led to the unearthing of a nationwide network of visa frauds across the US, the HSI has claimed. Sources said the case has an uncanny link to the 2013 diplomatic row between India and the US when Indian diplomat Devyani Khobragade was arrested over charges of visa fraud and perjury leading to her detention. “This can become yet another diplomatic row between both countries. The relationship between President Donald Trump and Prime Minister Narendra Modi is not in high spirits anyway,” said a former Indian Ambassador to the US who refused to be identified.